A little piece of a Country Music Hall of Famer is being released from her past. 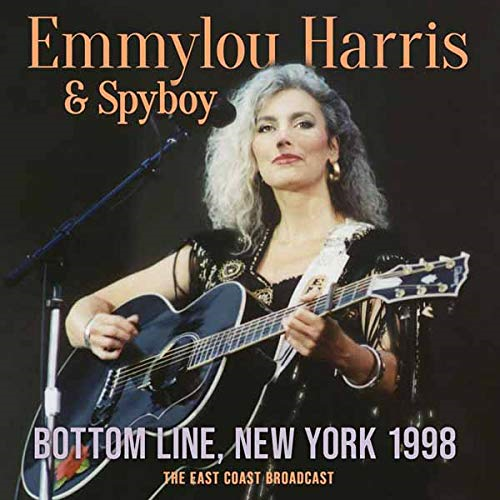 Just announced is a new radio broadcast recording from Emmylou Harris and Spyboy entitled Bottom Line, New York, 1998. Formed for the Emmylou Harris tour that promoted and performed songs from her 1995 career-redefining album, Wrecking Ball, country trio Spyboy - namely Buddy Miller on electric guitar and backing vocals, Daryl Johnson on electric bass, bass pedals, djembe, percussion and backing vocals, and Brady Blade on drums, percussion and backing vocals - were country music royalty to a man, led by the Queen of the genre. The tour included a number of shows in the US during 1997 and 1998, and a few more in Europe. On December 6, 1998, the ensemble played at New York's legendary Bottom Line club, a gig that was recorded for live FM Broadcast across the country. It featured a set that included a number of tracks from Wrecking Ball, alongside a host of Emmylou classics.